Welcome to Seattle Pacific Table Tennis Club where our goal is to promote the sport of table tennis in the greater Seattle area. 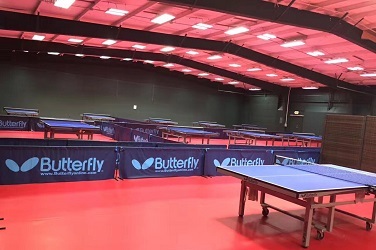 Our 9600 square foot facility includes 16 Butterfly Centrefold tables, an 18 foot ceiling, ITTF approved Gerflor flooring, and a friendly, professional environment. We are open seven days a week and all levels of players are encouraged to come and enjoy the great sport of table tennis. For those seeking formal training, our experienced coaching staff consists of several highly accomplished players. We offer after school programs, vacation programs, tournaments, and other special events. Watch our website for details and come join us for fun! Sign up now for our 2019 Summer Camp. The schedule and fees can be found on our Camps page. 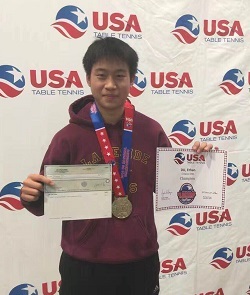 Congratulations to Crystal Wang, Ethan Du, and Ellie Yan who excelled at the recent 2018 US National Championships table tennis tournament in Las Vegas, Nevada. 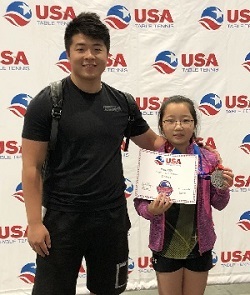 Crystal Wang achieved second place in the U-21 women's singles division, Ethan Du placed first in the U-2200 division and our young Ellie Yan earned second place in the U-10 girls division! Many, many hours of hard work and dedication led to their achievements and we wish them further success in the future. Our after school program is in need of used paddles. If you have an old paddle that you no longer want or use, please consider donating it to us and we will put it to good use! Contact Jerry Li at the front desk or email him at spttccamps@gmail.com. Please see our Facility page for more details and directions. Effective June 1, 2017, our rates will be increasing. 1. Adult: Annual $700 + tax; Quarterly $220 + tax; Monthly $85 +tax. 3. Family: $1,150 +tax; Quarterly $350 + tax; Monthly $135 + tax. SPTTC offers league play every Saturday night from 5:20pm - 9pm. Please visit our League page for details. Please visit our rules page to become acquainted with our general policies and open play rules. An additional $5 drop-in fee will be charged for non-members who wish to play after their lesson. Please contact coach Judy to inquire about private lessons at 206-802-5473. Please call 425-644-7833, 206-922-9282 or for further questions.